The St. Albans based Verulam Amateur Radio Club (VARC) ran an Amateur Radio Foundation Licence course in December. 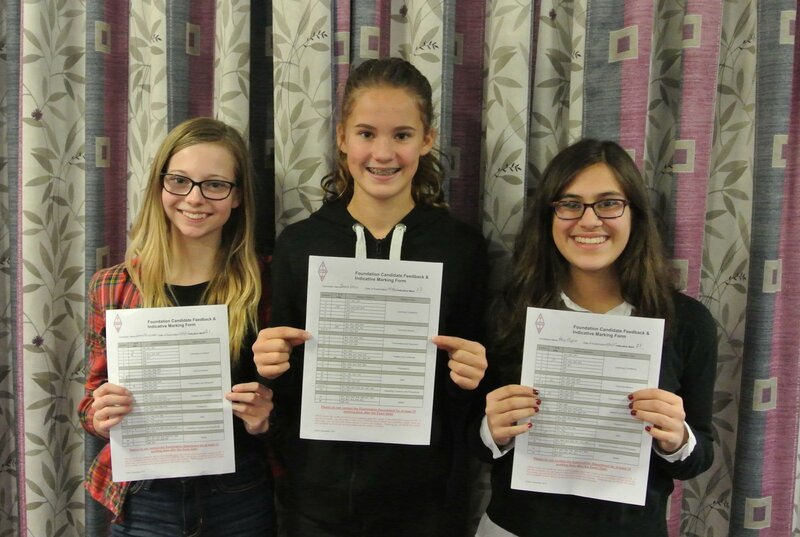 Three of the candidates were pupils from Sandringham School who took the course in preparation for the contact with Tim Peake. ARISS UK will provide and set up all necessary radio equipment (for example, low earth orbit satellite tracking antennas and radios) to establishing a fully functional, direct radio link with the International Space Station from the school premises. In a ten-minute window when the ISS will be over the UK, an amateur radio contact will be established with Tim, and students will be able to ask him questions about his life and work on board the ISS. The contact will also be webcast live via the ARISS Principia Webstream and the blog at the UK Operations team for ARISS will be updated with details of when the web stream will start early next week. What equipment do you need to hear the ISS? Almost any 144 MHz FM transceiver will receive the ISS; you can even use a general coverage VHF scanner with an external antenna. As far as the antenna is concerned the simpler the better. A ¼ wave ground plane can give good results because it has a high angle of radiation. Large 2m colinears don’t work quite as well because the radiation pattern is concentrated at the horizon. You can receive the ISS using a 144 MHz hand-held outdoors with its helical antenna but a 1/4 wave whip will give far better results. In the UK we use narrow 2.5 kHz deviation FM but the ISS transmits on 145.800 MHz with the wider 5 kHz deviation used in much of the world. Most rigs can be switched been wide and narrow deviation FM filters so select the wider filter. Hand-held rigs all seem to have a single wide filter fitted as standard. The International Space Station is traveling around the Earth at over 28,000 km/h. This high speed makes radio signals appear to shift in frequency, a phenomenon called Doppler Shift. When the ISS is approaching your location the signal may be 3.5 kHz higher in frequency on 145.8035 MHz. During the 10 minute pass the frequency will gradually move lower reaching 145.7965 MHz as the ISS goes out of range. To get maximum signal you ideally need a radio that tunes in 1 kHz or smaller steps to follow the shift but in practice acceptable results are obtained with the radio left on 145.800 MHz. There are two amateur radio stations available to astronauts on the ISS. The Russian Service Module has a dual-band Kenwood TM-D710 transceiver (this replaced the older TM-D700). Four antennas are available, three of which are identical and each can support both transmit and receive operations on 2m, 70cm, L band and S band. They also support reception for the Russian Glisser TV system, which is used during spacewalks. The fourth antenna is a 2.5 m long vertical whip that can be used to support High Frequency (HF) operations although at the present time there is no amateur HF equipment. The ESA Columbus Module has two Ericsson M-PA series FM 5 watt handheld radios, one for 145, and the other for 435 MHz, as well as the 2.4 GHz HamTV Digital Amateur Television Transmitter. Antennas are available for 145 and 435 MHz for the Ericsson handhelds; additionally, there are 1260 and 2400 MHz antennas for the HamTV system. 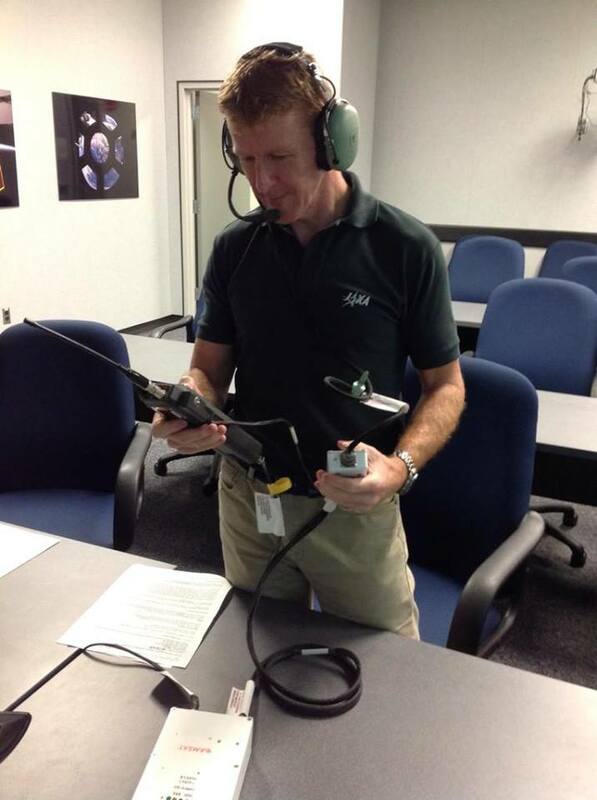 Tim Peake will the using the equipment in the ESA Columbus Module. The ISS HamTV system will probably not be available for the Sandringham School contact so there will be no live pictures of Tim as he takes part in the contact. However, the HamTV system should be transmitting albeit with a blank picture. Most Amateur Radio on the International Space Station (ARISS) operations are split-frequency (each station uses separate receive and transmit frequencies). The downlink is the earth station’s receiving frequency. The uplink is the earth station’s transmitting frequency. In ITU Region 1 should you be fortunate enough to hear an astronaut calling CQ on the 145.800 MHz downlink you should switch in your -600 kHz repeater shift so your reply is on the 145.200 MHz uplink.